Notice: This travel program is administered by Joy! Cruises and Tours Inc., PO Box 900, Graham, NC 27253. Phone 919-680-3337. Email: info@joycruisesandtoursinc.com. If you need assistance with booking any package, please contact us. in the event any sponsor cancellation occurs. All tour and cruise rates are not guaranteed and therefore subject to change until deposited and/or ticketed for travel. To be removed from any email or other unwanted communications, please send an email to info@joycruisesandtoursinc, or by mail at the address listed. 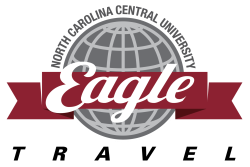 You may also contact the North Carolina Central University Office of Alumni Relations with questions or comments at 919-530-6363, or email alumni@nccu.edu.